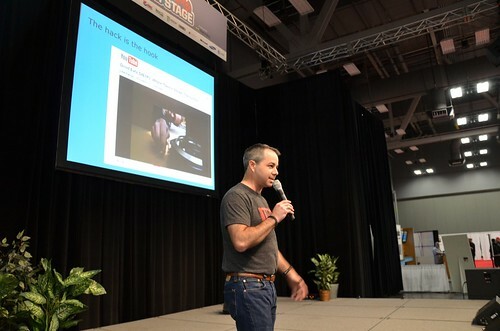 BUILT is a series of short talks by DIY creators which launched at SXSW 2011, and Bike Hugger is bringing it back to SXSW 2012 for their biggest event of the year. This attendee favorite delivers ten 5-minute presentations by diverse speakers on rapid fire topics surrounding the idea of re-purposing: taking the ordinary and creating the extraordinary. Come witness the future of creativity at BUILT 2012 on Next Stage. BUILT: Giving New Purpose to the Ordinary Mon. March 12th at 12:00pm. Next Stage in Exhibit Hall 4. Our call for speakers is still open for Built at SXSW and we want to put together the best program we can. We’re most interested in what you’ve got to say about re-purposing: taking the ordinary and creating the extraordinary. You can also talk about what you want, cause we know you got something to say. We’ve got a Google doc form set up on our Built page. Kindly fill it out and we’ll get back to you soon. Your talk goes here. Cruftbox rocked it last year with his story about a BBQ.